Planet Hugill: What exactly is the National Opera Studio? The National Opera Studio (NOS) is one of those organisations about which you read, noting that a certain singer is or was a Young Artist at the National Opera Studio. But quite what the NOS does or what being a NOS Young Artist entails is perhaps less clear. From 4 to 6 May 2017, the NOS Young Artists are presenting Dubai - Rostov - New York: Scenes from Contemporary Operas at Wilton's Music Hall, directed by David Pountney. 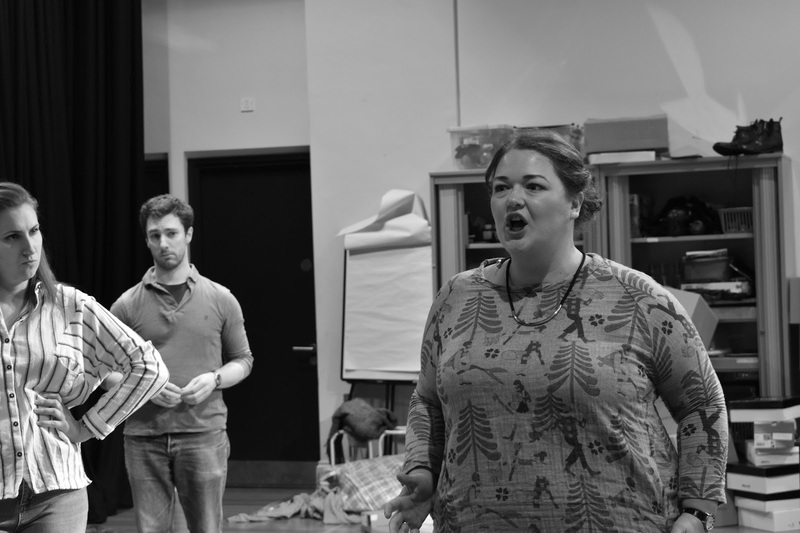 So I recently went down to the NOS premises in Wandsworth to meet three of the current Young Artists, Penelope Cousland (mezzo-soprano), Christopher Cull (baritone) and Frederick Brown (repetiteur), and to find out more. The NOS is based in an old Huguenot chapel in Wandsworth, which gives them a large, airy studio space (holding around 70 audience), along with practice rooms, office space and a library. It was in this latter that I met three of the current young artists; and I was intrigued so see on the shelves alongside more familiar fare, vocal scores for Meyerbeer's Gli Hugenotti (the Italian versions of Les Huguenots) and a German version of his Le Prophete. For Penelope, the singers' time at NOS is a platform between study and going into the real world, it is a chance to build contacts, work on technique, acting and characterisation, to solidify what they already know. As an aspiring repetiteur and conductor, the period is a chance for Frederick to learn to respond to language, listen to singers and acquire specialised operatic techniques. Christopher emphasised that the year saw the singers being more independent than at college, they can train the way they want to, and they decide what to achieve and get coaching. There is no set syllabus and, as in the profession, coaching takes often place around roles being learned. But the subjects are the same as at college, but the coaching is more specific to what the singers need and there can be more of it because there are fewer of them. The singers' year starts with a series of weeks devoted to particular subjects, language (an Italian, a French and a German week), acting and stagecraft. At this stage the artists take many classes together. Each week has a guest coach who combines long group sessions with individual coaching, and there are also resident coaches. These coaches are generally experience operatic performers or specific language and acting coaches, as well as a psychological resilience coach helping the young artists learn how to stay positive. And pianist Iain Burnside came to give the young artists a week of song. When joining the NOS, each singer picks a role on which to concentrate, so that Penelope chose Didon from Berlioz's Les Troyens, whilst Christopher chose the title role in Ambroise Thomas' Hamlet. That I was chatting to two singers concentrating on French roles was a coincidence, the majority of the singers this year have chosen Italian roles. As a repetiteur, Frederick was assigned three singers giving him a nice mix of operas and voice types, Debussy's Pelleas et Melisande, Donizetti's L'Elisir d'Amore and Mozart's Cosi fan tutte with a soprano, mezzo-soprano and baritone. Though the singers tend to only perform their chosen roles in assessment, the process of learning including the necessary linguistic and stylistic elements, means that they understand the full process necessary for learning a role. Penelope chose Didon because she felt she was weakest in the French language, and that of the three possible choices Didon would push her most. Christopher chose Hamlet because the role presented lot of technical difficulties and dramatic possibilities, as well as pushing him in the French language. Frederick by contrast will spend a lot of time at the piano whilst his three singer associates are being coached, as well as doing coaching himself. He feels he learns how to listen better and how singers hear language, as well as having the chance to play operatic excerpts with experiences repetiteurs listening and given advice. For all three, the process of developing into a finished artist is a long one, but Penelope adds that they were aware at the beginning and signed up for it. The singers in particular need to have a lot of confidence to play a slow game and not rush into things. Both Penelope and Christopher have the type of voices which tend to take a lot of time to mature, and so both need to find suitable roles until then and to make a living. As well a their chosen roles, during their year at NOS the singers work on programmes of staged scenes, four programmes in all; one of contemporary scenes and three done in association with one of the national opera companies. 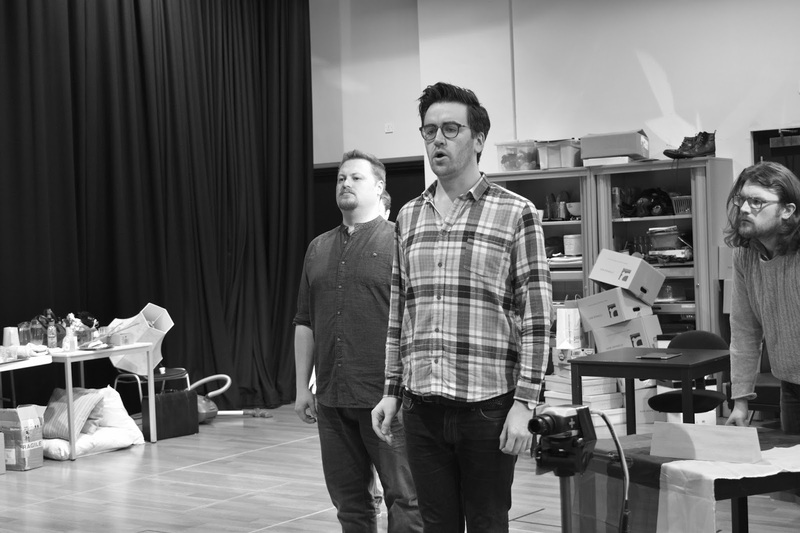 They go for a week to one of the opera companies, this year to Opera North, Scottish Opera and to Welsh National Opera where they spend a week and work on the scenes, staging them with orchestral accompaniment. The contemporary scenes are done with piano only, and the others are repeated in London with piano. These scenes give the singers chance to experience singing solo roles in full size opera theatre. Before she came to NOS, Penelope's main experience of singing in larger theatres was chorus work, though Christopher has done solo roles with Grange Park Opera, Opera Northern Ireland and at the National Concert Hall in Dublin. For the repetiteurs, the scenes provide the opportunity to get experience as one of the music staff, going fro accompanying to giving balance notes at the orchestral rehearsals and assisting the conductor. As the NOS is associated with the six national opera companies, this means that the singers get the chance to take part in auditions with the companies, something it is difficult for a young singer to do on their own. Even hear, they understand that it is a long game, and being heard may simply mean that a singer is on the radar of a company. Similarly for Frederick, there is the chance to be heard and spotted. Though of course, after a singer's audition, it is difficult for the representative of the opera company to say anything other than 'nice to hear you' to the accompanist. Further ahead, Christopher will be singing Spencer Coyle in a production of Britten's Owen Wingrave with Opera Collective Ireland, whilst Penelope is going to Bayreuth to sing in the festival chorus (giving her he opportunity to hear real Wagner singers). Frederick will be working at Buxton Festival this summer and then going to join the music staff of Hamburg State Opera for two years. Next up though is NOS's contemporary opera scenes, Dubai - Rostov - New York: Scenes from Contemporary Operas. As part of a policy to give the young artists more exposure, the contemporary opera scenes are being staged this year at Wilton's Music Hall (rather than simply to an invited audience at the NOS in Wandsworth). The scenes take place on 4, 5, & 6 May 2017, and include Elena Langer's Tucha (performed by Penelope) and Langer's opera Four Sisters, plus Errollyn Wallen's Sabine Spielrein and Joanna Marsh's My Beautiful Camel (which I gather is rather funny). The scenes will be directed by David Pountney. The casting for the contemporary opera scenes again emulated the outside world, and the singers had mini-auditions with Pountney and were allocated roles. For the other opera scenes, they can make suggestions but are essentially allocated, and all the roles tend to be new for the singers thus giving them additional challenges. This autumn the 2017/2018 intake of young artists will get further opportunity for public exposure as the NOS is presenting a series of opera scenes in association with the Victoria and Albert Museum's forthcoming opera exhibition, Passion, Power and Politics.